Surface texture. 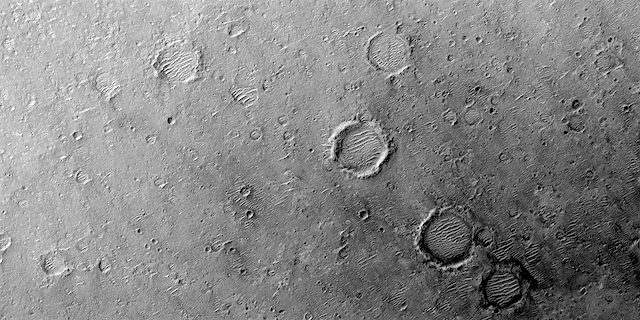 Interesting how the dune ripples within these shallow craters all seem to have a similar orientation. This image is within a crater in the Arabia Terra region. This entry was posted in Reports and tagged Arabia Terra, dunes, High Resolution Imaging Science Experiment, HiPOD, HiRISE, HiRISE Picture of the Day, Mars Reconnaissance Orbiter, MRO, NASA, regolith, rocks, sand dunes, University of Arizona. Bookmark the permalink.